While this home is filled with its fair share of stunning sights, it’s possible that the greatest impressions come with your eyes closed. Simply head for the back patio, just beyond the great room. Sit back, feel the warm flicker of the firepit and surrender to the hypnotic rhythm of a wall of waterfalls that backs to the forest beyond. Inside, the scene is just as striking. The great room and its towering ceilings and fireplace frame the forest. Stage right from here is the dining room and a kitchen, breakfast nook and large pantry with abundant storage, a double oven, microwave, wine cooler and coffee maker. This 6,723-square-foot home is primarily one level with a couple of step-down levels, including one that leads to a large bedroom as well as a master suite with office, fireplace, lawn patio and a massive center beam. The master bath has two walk-in closets, a steam shower and a sizeable oval bath. On the other side of the home is an attached casita with its own private entrance. Here, you’ll find a living room with fireplace, mini kitchen, master suite and master bath with steam shower, and access to the main patio. Just off the impressive main entry is a large media room with a 4k, 82” Samsung LED TV mounted on the wall. The arrival experience to this 5-bed, 5.5-bath home is setup with a courtyard that exudes a sense of welcome and comfort. First-rate appliances include Wolf, Sub-Zero and Perlick while radiant heating warms floors throughout the home. Kitchen counters are custom quartzite and feature two farmhouse sinks. There’s a central vacuum system, air conditioning, and Lutron lighting and automated control panels throughout. Floors are oak while doors, trim, molding and baseboards are alder. Landscaping is immaculate at all points around the home and the exterior is a boldly beautiful blend of granite columns, cedar trim, cedar lap siding and custom metal beams. 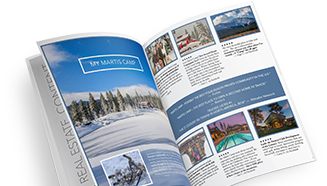 On top of it all, just off the rear property line is the trail system connecting the privacy of the home to the best of Martis Camp.